Many an hour was spent in a silent darkened room visualising every step from Ringstead Bay to Lulworth Cove in Dorset. 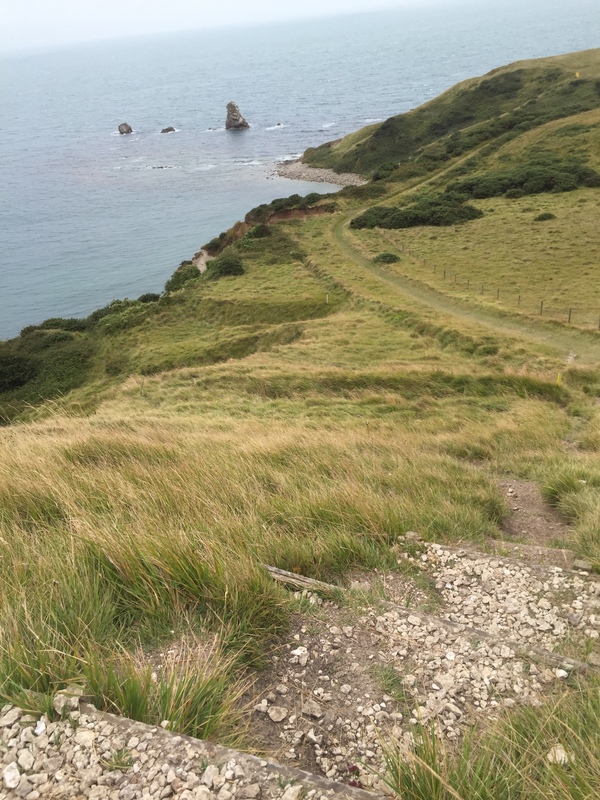 A walk I had achieved many times in adulthood and parts of which (Lulworth to Durdle Door) countless times in childhood. Mentally walking those steps helped to distract from pain and helped to pass the endless days of being mostly bed bound seven years ago. Today I’m writing this, sat at my computer, after completing the walk, plus extras, for real. Mr C and I took a train to Weymouth last Tuesday morning. This was the first time I had taken the ten minute walk from our home, down hill, to our local train station in years. The sun still stretching it’s rays coated gentle mists over the views across to Glastonbury Tor . We’d both packed as lightly as we could, ( but more than we’ll pack in future) for the three day walk to Swanage, and the two extra nights staying with friends who were there. 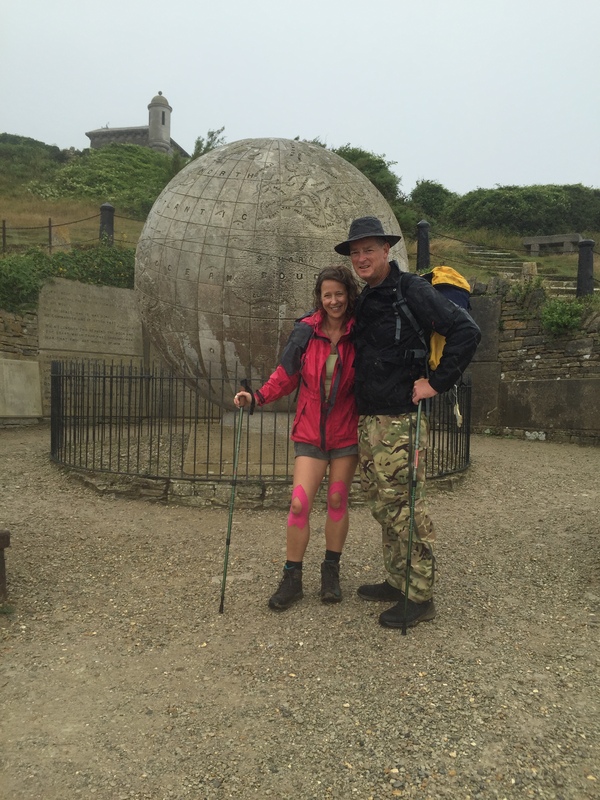 We planned this ‘holiday’ six weeks earlier after a few walks gave me the confidence to attempt this challenge. Mr C had originally thought it would be good to camp along the way but I soon convinced him that I’d need a nightly bath in Epsom salts and we’d both appreciate a reasonable nights sleep after a long day of walking. Luckily we managed to find a room at a walking holiday establishment in Lulworth and a small B&B in Worth Matravers. Our friends in Swanage were happy to host us for the last two nights. 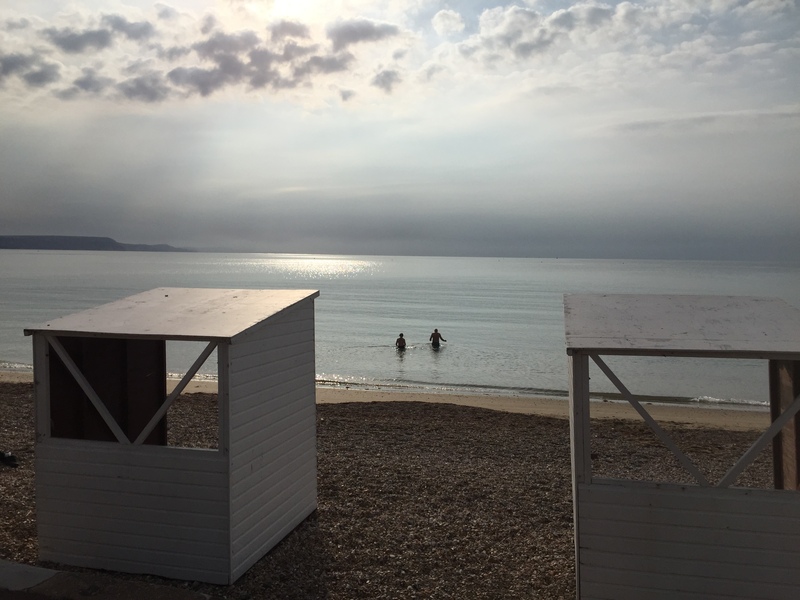 Arriving in Weymouth at 8.15 am we enjoyed seeing the year-round dawn swimmers take their daily dip into a perfectly calm Weymouth Bay. We walked along the seafront and after 35 minutes took our first break at ‘The Oasis’ cafe on the beach after Lodmoor Country park. I haven’t drunk coffee since I was 18 but I had learned from Dr Myhill that a shot of coffee is a great stimulator for the adrenal glands so in times of need I treat myself to a ‘milk free coffee mocha’. This often causes a bit of a fuss and disbelief that I could drink a watered down delight but the oasis had a generous supply of shakers filled with cinnamon, cocoa and nutmeg, so I added the lot. That coffee goes down in my top three drink occasions, second only to a yet- to -be- beaten hot chocolate in a back street in Venice ten years ago. The sky was mostly blue and already the temperature had risen so it was time to whip off my leggings and expose the flouresant pink knee KT tape I’d applied after the advice of my NHS Orthotic therapist. ( A rather wonderful Mr Crutchley) These knee tapes created quite a stir during our walk, a great topic of conversation on meeting fellow walkers. Recharged we then had our first ascent at Bowleaze Cove. The landmark of my childhood, a magnificent, yet always in need of a lick of paint, Art Deco holiday camp/hotel frames the bay, now surrounded by caravans and a fairground, but I’m sure would look spectacular spruced up with palm trees entwined in lights and fountains, restored more in line with Burgh Island than an early Pontins. Behind the holiday park on a lower lookout point is a wonderful wooden bench. Perfectly positioned to give a view of Weymouth Bay, dedicated to a ‘Jim Frost who loved the sea’. 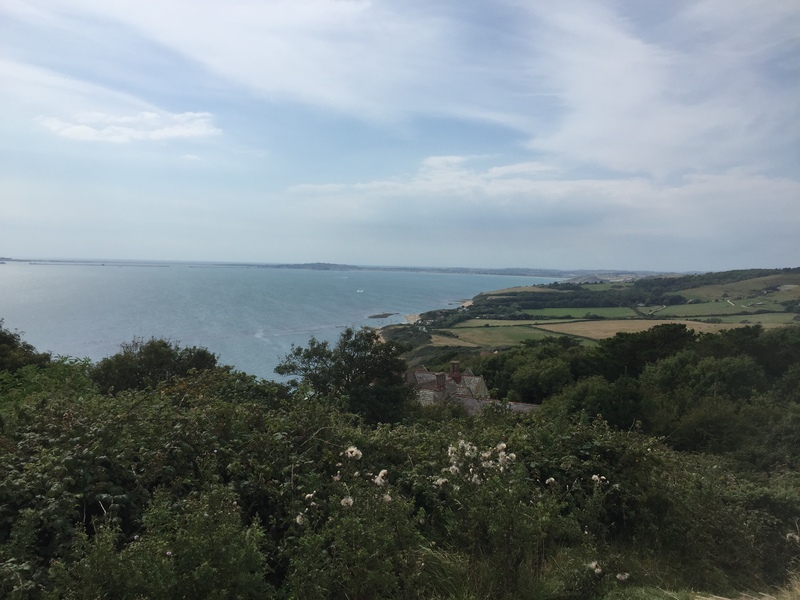 There then followed quite a steep incline to Redcliffe Point giving yet more spectacular views back to Weymouth and Portland and far into the distance St Aldhelms Head. I wonder if this was the point that Constable had sat and sketched for his series of ‘Weymouth Bay ‘paintings in 1816? Passing breakfasting campers at Eweleaze Farm and even an outdoor yoga class, we up-d and downed the cliff pass, seeing silent secret coves before descending into Osmington. It was too early for a stop off at the Smugglers Inn and we continued on to my favourite picnic and swim spot, Ringstead Bay. We arrived shortly after 11am and with warm blue skies and little breeze I enjoyed cooling off in the sea. Our picnic was accompanied by some of the best chips on the South Coast from the Beach Cafe. After a couple of hours swimming and sunbathing our next leg began. This is the well worn path that I’d traversed in my mind so many times. I’d mastered each mindful step so that It would take the same two hours in my imagination as a brisk version would take in the flesh. Stopping, as is the rule, at the breathtakingly beautiful St Catherine’s chapel at Holworth, we met two regular walkers, Deb and Jane, from Hampshire and Cornwall. Friends for over forty years they now meet up and are walking their way around the coast. 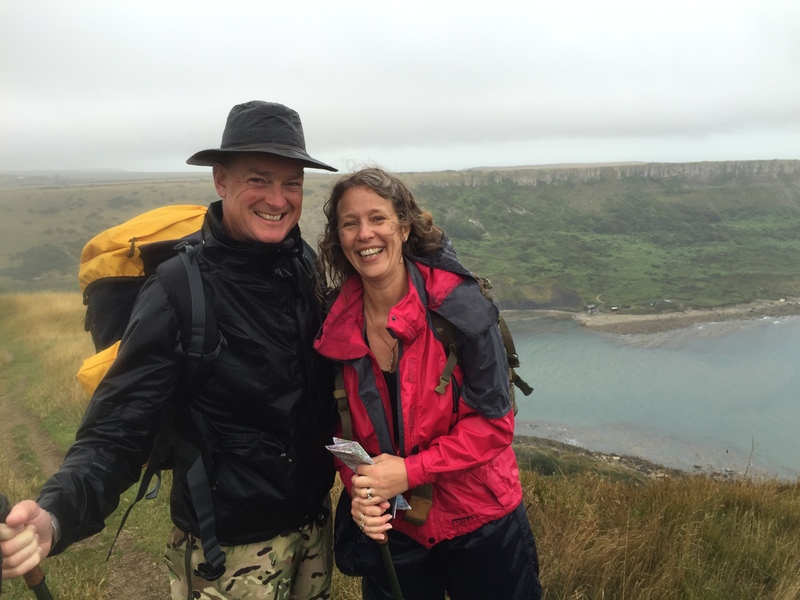 Last year they achieved ‘fifty miles for fifty years’ as they celebrated their birthdays walking along the Cornish Coast. 2015 they enjoyed the same first 25 miles as us. They had, with experience, packed far lighter than us and enjoyed jogging up the hills. Over the next two days we ‘hare and tortoise-d’ together. Whilst blissfully loving walking amongst the amazing beautiful wild chalk land flowers, wishing I knew their names, yet recognising their cultivated descendants, I suddenly found myself face down amongst them! Pinned to the ground by my ruck sack and praying that the KT tape had supported my knees enough to prevent them from dislocating. Mr C was forced to turn around on hearing an ‘Oh S**t’. As he pulled me up I felt sure that blood was smeared down my face as my forehead, nose and upper lip felt sore, but luckily moist with sweat not blood. 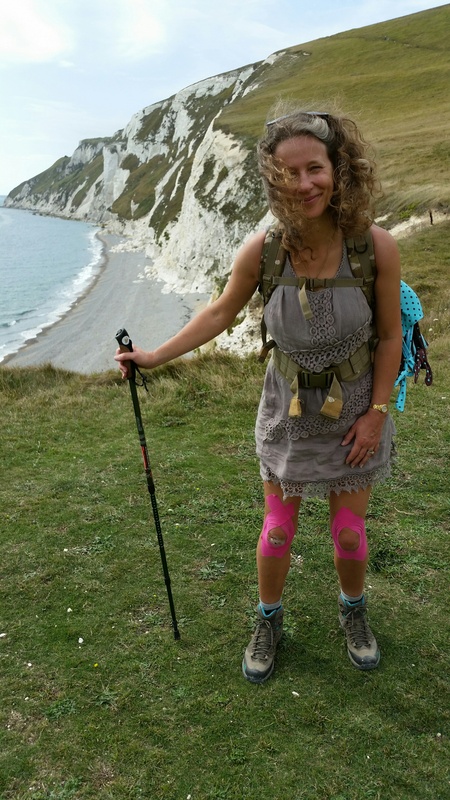 My right knee was grased and pebbledashed with the crumbs of chalk rubble that had helped me slip. We were around a mile from Durdle Door and with another couple of peaks and troughs, no alternative but to carry on. Shock turned to giggles and the descent continued with me re playing the spectacle wondering how it could have happened or prevented! So good to laugh though! I had hoped to be swimming at ‘Man o war’ bay but the ice-cream van above Durdle Door was far more appealing. My knees were stiff now and I looked forward to arriving at our first B&B of the adventure. This Dorset landmark is so very familiar to me from my childhood and so many teen and adult memories of trekking here from Lulworth with various family and friends. This day quite a different sight lay before us. 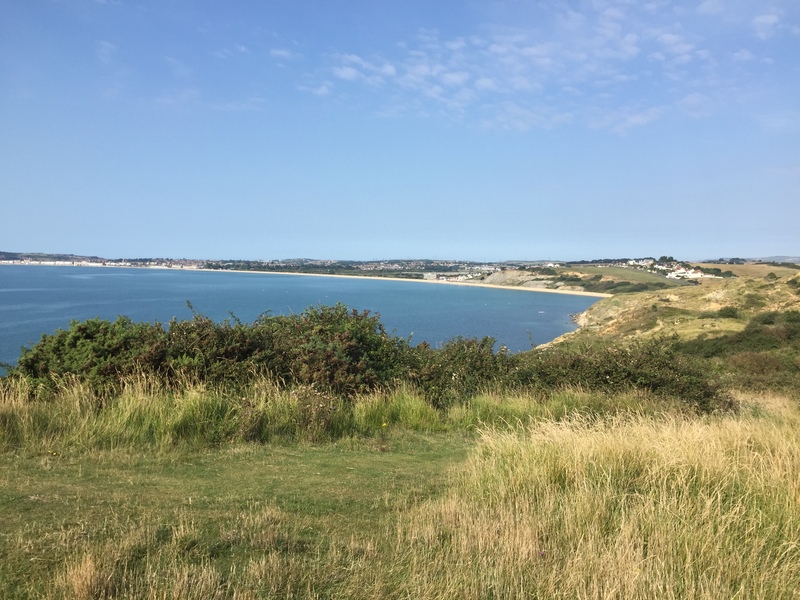 It is expected to be busy on a sunny day in August, however, large groups of asian tourists enjoyed the sea and cliff tops, the like I’d not ever seen in any part of Dorset before. Maybe I’ve just not been out much and the world had changed during my absence. I felt so elated that so many nationalities had travelled across the world to see ‘my’ home coast. It had never been an easy walk which made the crowds all the more exciting, ALL these people had trekked up the enormously steep track from Lulworth, so I thought. During my chrysalis years, the Durdle Door camp site had expanded it’s enterprise, a large carpark now stretches down ahead of their caravans and tents. It’s still a steep walk down and even steeper back up again, but it’s reduced the challenge by about 3 miles for the round trip! I’ve since heard a tale from a friend that her grandparents used to visit Durdle Door when the only way down to the beach was by climbing a rope down the cliff face! We arrived in Lulworth Cove at 5.15pm. Mr C had been promised a cider on his arrival and so post cider, a quick visit to Stair Hole caught Hugh Fearnley- Whittingstall filming. We then found our room for the night. 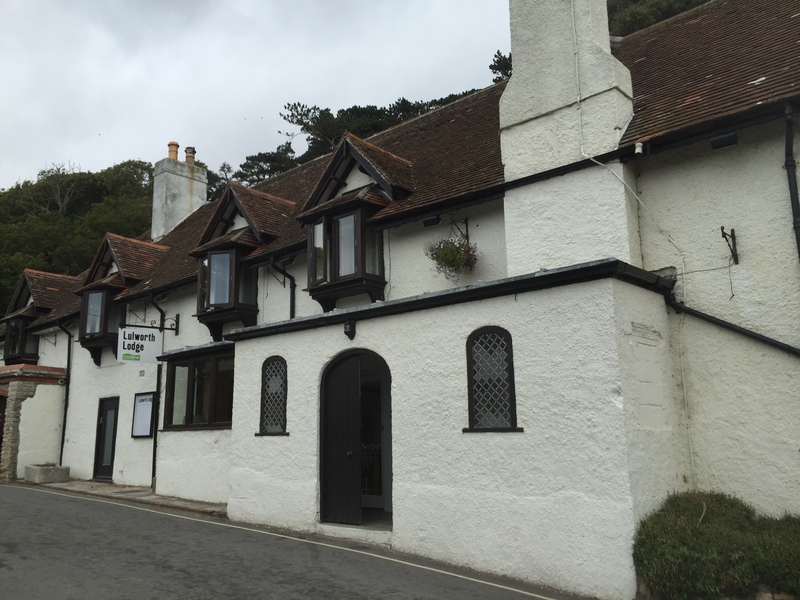 ‘Lulworth Lodge’ is owned by ‘HF holidays‘, a walking tour group. Spare rooms are advertised online which is how we found them. First impressions were very good indeed. On entering the establishment two large wooden dinning tables, creatively dressed for dinner and a selection of very welcoming sofas by the windows with views towards the famous cove. We’d booked to have dinner there and take advantage of their packed lunch service for the following day. Our room was definitely a minimum of four star quality with a much needed ensuite bathroom. I so enjoyed my Epsom salt bath before dinner along with a catch up of ‘The Archers’. Mr C is certain that his Steak pie supper was the best he’d EVER had! It was all served up in ‘walkers’ portions, too much for 6 year old Guy who’d joined us for dinner with his Brother Noah and Mum Helen. Teacher Bridget also ate with us and together we retired to chat on the comfy sofas and played scrabble with Guy. Why is it that all the adults have a plethora of rude words to choose from when playing youngsters? As we got up to go to bed I felt an excruciating pain in my left knee. Not the usual knee to offer such pain, but it was the knee that took the full brunt of my tumble earlier. I tossed and turned during the night wondering if I should, or even could continue with our walk the following day. 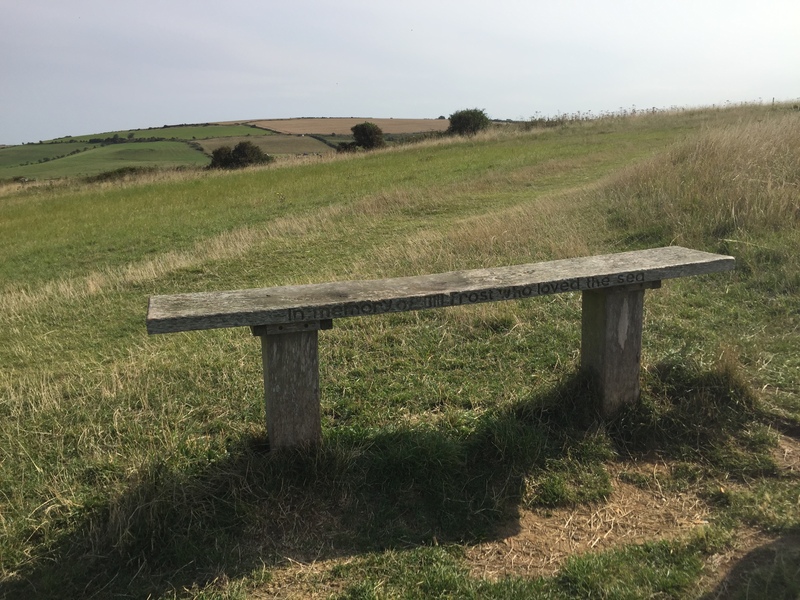 I downed a few arnica tablets and prayed…The twelve or so mile walk from Lulworth to Worth Matravers has no pubs or bus stops as reprieve. Once embarked upon, like the Inca trail, there is no choice but to complete it. I remembered my friend’s comment not to have an accident as her husband would be having to rescue me being on duty this week for Coastal rescue! Although I could enjoy the funny side of being rescued by a helicopter, this walk was no laughing matter, particularly with a dodgy knee. I have often wrestled with the difference between ‘good’ and ‘bad’ pains, which ones are to be pushed through and which are to be embraced with rest. My 4 am resolution was to ask the hotel manager if they could arrange a luggage ‘transfer’ for me. I’d seen somewhere that some walking tours take your luggage from B&B allowing walkers just to walk, unencumbered by heavy rucksacks. This decision allowed me to sleep through the pain and hot flushes, common with both my age, and any physical stress! Waking at 6 am I had to find a way to talk to hubby. I knew he’d be cross if I put my body through any unnecessary pain or trauma. Neither of us wanted this walk to set my recovery backwards. The lovely Manager Richard did his best making phone calls but sadly ‘luggage transfers’ wasn’t a service they could offer me. Enter my ‘Angel of the Day’. Helen, mother of the two lovely boys we’d shared dinner with, overheard our plight and gave me a piece of paper with her number written on it. ‘We’re only going to Monkey World and staying locally so if you find you can’t continue, call me and we’ll pick you up, taking you to your next B&B’. That was the sign I needed, a sensible back up plan, my safety net, that didn’t involve a coastguard helicopter! Knees freshly re strapped up with KT tape, stomachs filled with an excellent & plentiful breakfast ( I had eggs benedict on a gluten free bun) and having collected our packed lunches, pre ordered sandwiches for Mr C & a steamed salmon salad for me, plus an ‘all we can carry’ pick & mix selection of fruits nuts, crisps, cakes & pork pies, enough to keep us both fuelled for the next leg of our adventure. We saw Hugh FW again filming on the beach at Lulworth Cove and at 10am on an overcast morning we were the only others on the beach. Maybe much to the film crews frustration we then walked the around the entire bay before finding the coast path and our first climb of the day. Once we were walking my knees were fine, a ‘normal’ stiffness to be expected after the previous day’s ten miles. 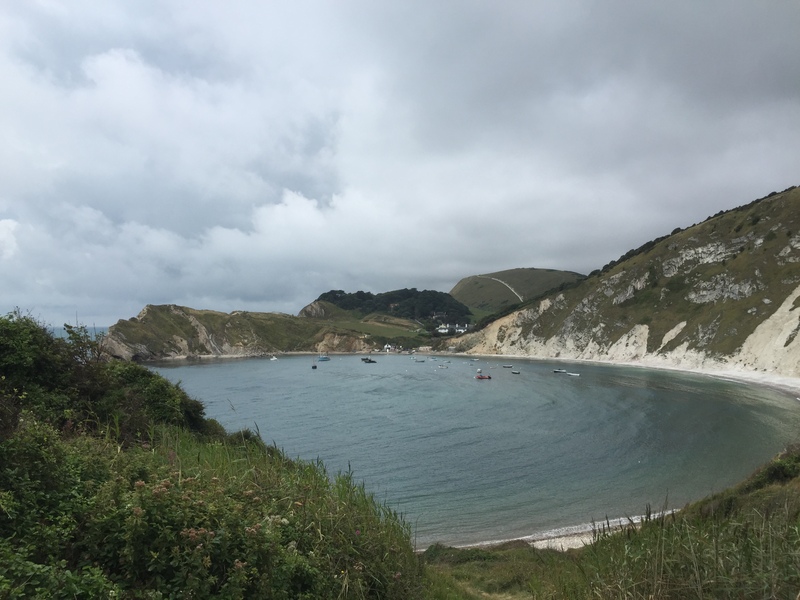 A welcome flat walk as we entered the normal closed Lulworth Army ranges, along the cliffs passing the fossilised Forrest and on to beautiful Mupe Bay. 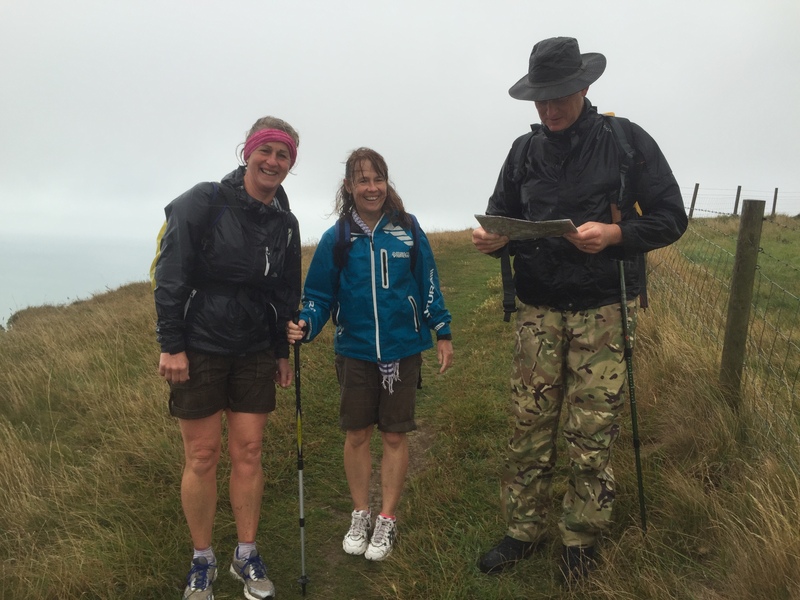 A wet mist had set in so we put on all our waterproofs before embarking on one helluva steep climb up Bindon Hill. This ascent was thankfully broken by a brief chat with two chaps making a short walk before the forecasted rain & wind set in. As we stopped and took in the view, the familiar sight of two colourful ‘joggers’ below , Deb & Jane were on our tail! We enjoyed a rest at the summit, watching the ‘girls’ bounding up the hill, the sky was still clear enough for us to see along the coast to our destination of St Aldhelms head. The rain had started to fall now as we walked along the ridge line. Long grass either side of the trail wet our boots and gradually seeped through to our feet. A very steep decline to a ‘James Bond’ style military beach ( Arish Mell) and a welcome bench where our first snacks were devoured as we watched Deb & Jane descend like mountain goats at high speed. We had a brief exchange about our Lulworth B&Bs. They’d stayed at the pub, great food but not as luxurious as our accommodation. 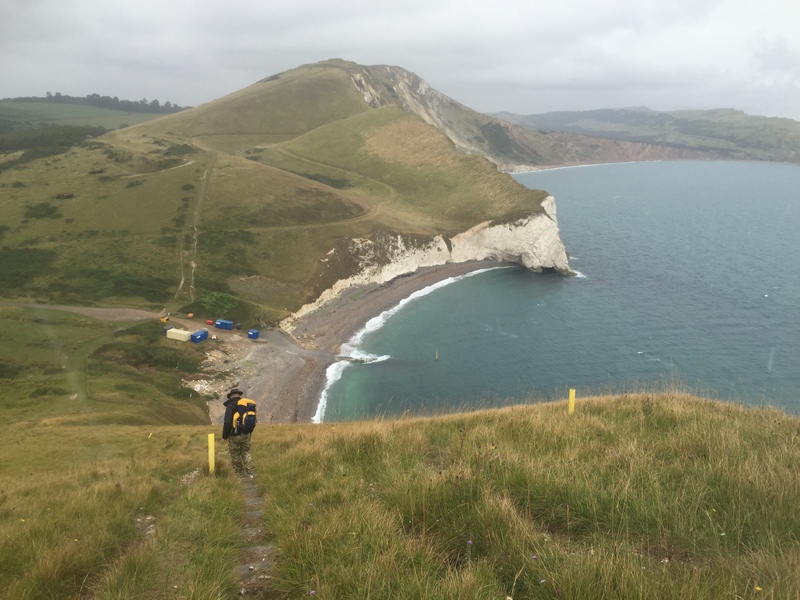 Without loosing any momentum they charged up the next hill, deceptive without any carved out steps, a very long slow climb rewarded by a strong offshore wind and spectacular views of the coast and inland to Lulworth castle. 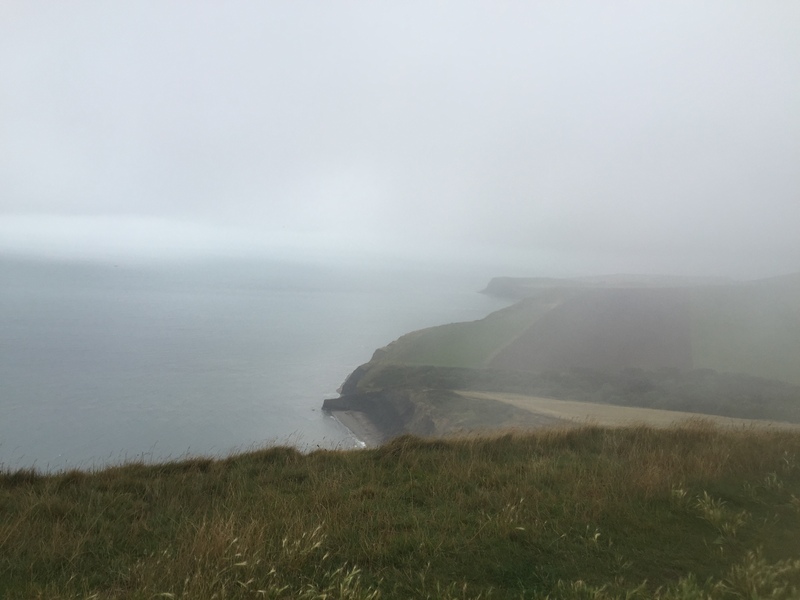 The girls had veered inland towards Tyneham but we stuck with the coast path and really enjoyed the summit of Flowers Barrow. An ancient settlement with sheltered corners and prominent look outs. An enjoyable romp down towards Worbarrow Bay , experimenting with varying speeds as Deb & Jane said speed going down eased the knees… I had visualised swimming in Worbarrow Bay but it was approaching noon, we were wet and although the rain had eased it was expected to get worse so a swim wasn’t necessary to cool off. Our check in time at Worth Matravers was between 5 & 6 pm so getting some miles under our feet was a priority. A brief stop for apples and flapjacks, watching dog walkers and resilient families climb Worbarrow Tout. We followed an older couple and their dogs climb the next ridge. Seeing septuagenarians, one needing two walking sticks, climb a steep hill was a good motivator for me. Despite tired a get legs, if they could manage it, I certainly could. It was a long and steady climb to Tyneham Cap and I had to admit to being a little disappointed when the opening view showed that Kimmeridge Bay was a little further away than I’d hoped. The next leg was long, misty and mainly downhill. The drizzle set in as we carried on, mainly in silence. No gasps of wonder at the spectacular views this day. A steady plod with the goal of a picnic at Kimmeridge. 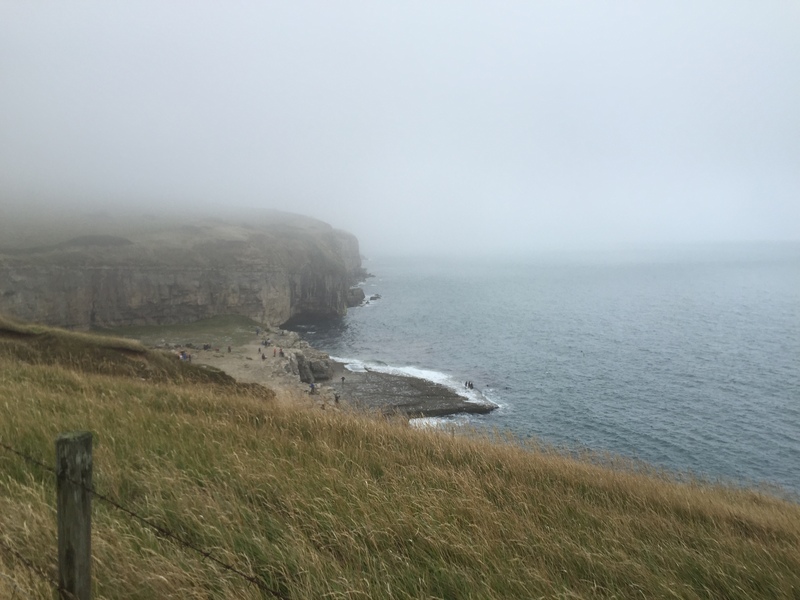 The car park was almost empty, teenagers poured out of a minibus on a geography trip with clip boards boots an anoraks and a few resilient tourists dressed their youngsters in wet weather gear and ventured out onto the ledges fossil hunting. After a friendly wave from two very old ( and possibly madder than us) ladies sat in a community mini bus, and making use of the wonderful, clean public loos, we sat on a bench by the slipway and dug into our packed lunches. It was time to put back on our heavy duty waterproofs before embarking on what was the most scary and tiring leg of our day. 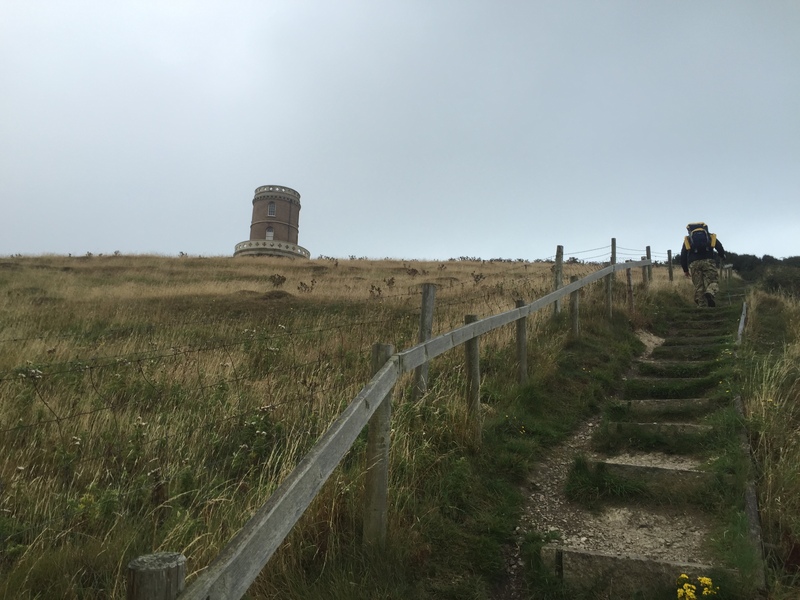 There were an awful lot of wet, slippery steps leading up to the Clavell Tower. Quite a landmark and only recently rebuilt after having been moved due to cliff erosion. It would have been a welcome place to rest right then, but we still had a punishing 5 miles in increasingly windy and wet weather. Neither of us had walked this path before and there were moments when we thought we shouldn’t or wouldn’t be walking it again. We were mostly only feet from the sheer drop to the sea, protected only by long grasses and brambles and the stiff wind, thankfully blowing inland. To our left was a deepening crack along the edge of the footpath and a barbed wire fence, keeping sheep and cattle from falling over the edge. My mind was filling with ‘what to do first’ scenarios should the cracks widen taking either of us, or both plummeting downwards. We would ‘ride’ the top and land a few safe feet above the waves, or would it crumble and slide engulfing anyone as it slipped? No phone signal and no sign of other walkers and other than from reading the soggy map, no idea of how many more inclines or descents before our goal. Thankfully, we had a good few miles on the flat so we kept up a good pace. We passed one stray walker then a very sorry looking group of Czechoslovakian students. They asked if we knew of a pub in Kimmeridge, oh how we wished we could say ‘yes’. Even the ice cream van hadn’t stopped at Kimmeridge this day and as they probably wouldn’t reach the tiny village until around 5 pm, even the tea rooms would be shut. So very, very grateful that we weren’t camping that night like those poor wet youths. 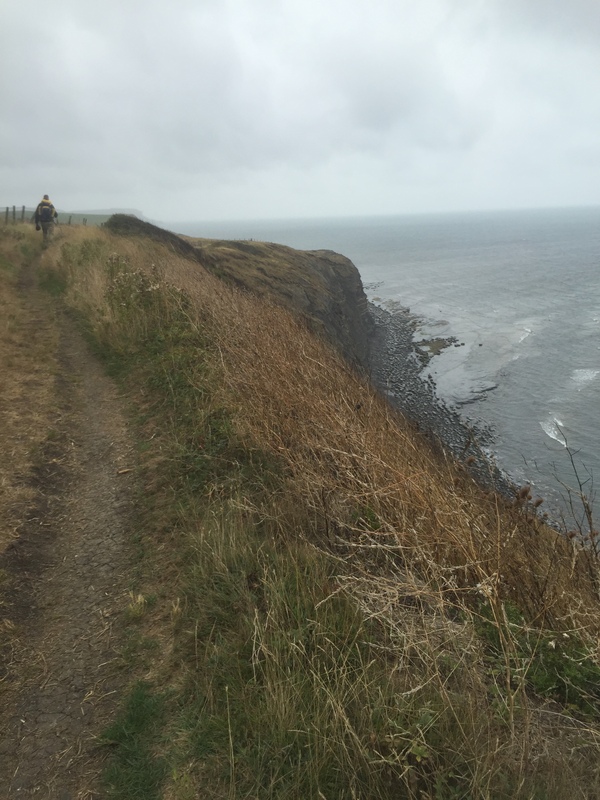 I was looking forward to reaching Chapman’s pool but there was one last test- Houns-tout Cliff over Egmont Point. A rather fun dip into woodland, crossing a bridge then ahead of us was an almighty high climb. 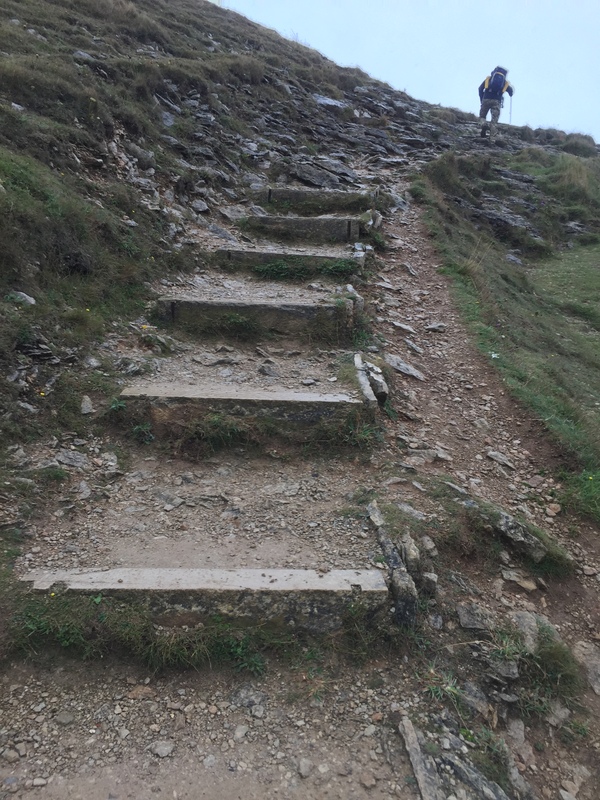 No stone steps here, just worn and muddy, now slippery, footsteps worn into the cliff side. Again a barbed wire fence on our left, which thankfully had one un barbed wire which helped haul me up when my boots could find no grip. Deb and Jan were hot on our heals, we saw them ‘romping’ along the cliff walk, chatting all the way. Such a relief to see familiar figures and to share this scary and challenging climb. My determination made sure that I reached the summit before them. Mr C had already settled on the stone bench and cheered me on. To distract myself I spotted Encumber Dairy Farmhouse. It was misty and getting dark but it reminded me of Francis & Elizabeth Poldarks’s house, tucked behind a small woodland. Nothing like thoughts of Poldark to distract the mind when the going gets tough! We sat on the bench, deep with puddles, and soaked to the skin from rain and sweat and admired the view… Deb and Jane bounded up and we all squeezed onto the welcome bench and rummaged in our bags for snacks and drinks. Feeling like we’d been reunited with old friends we chatted and laughed, taking ridiculous photos of each other and all jogged down the steps towards Chapman’s pool. The pool looked beautiful and I would love to visit it again, on a dry warm day. We now all had a mission, to get to our B&Bs as quickly as possible. It was 4pm and we were confident we could get to ours before 5. The girls were heading for Wareham, but planned on catching a bus from the pub at Worth Matravers. Then things took a turn, for the worst. Despite following the marked footpath and reading our maps, the path wasn’t easy or well marked! Not a single sign pointed towards the nearest or another village. Local landmarks and car parks were pointed to but no village. We were all tired and getting frustrated, time was ticking on and despite our noses feeling we should head one way, the paths and signs pointed the other. Eventually we parted ways on a very scenic ancient byway where a sign finally pointed to Kingston ( where we knew a bud would be going for the girls) and Worth Matravers. We trudged on and on and passed a very miserable camp site with an empty van, a couple of tents and a row of chemical toilets. At 5.45pm we arrived at the door step of our B&B Chiltern Lodge. What a wonderful welcome, David and Ann offered us cups of tea and had a very sensible large porch for us to strip off and leave all our soaked clothes and boots. A steamy hot bath before a delicious dinner cooked by Ann. David is a very talented photographer and the dinning room is adorned with his framed prints, greeting cards and even a range of fridge magnets! They even put the heating on, (remember this is August 19th!) Poor mr C was too wet and tired to make it down to the famous cider pub, The Square & Compass, a mere few hundred feet away. A good sleep and a hearty breakfast, almost dry boots and bags we were ready to set off around 9.30 am. A simple ‘short’ walk onto Swanage where we’d be meeting our friends. By now we could manage and hills or dales and enjoyed the fact that the sky was clear enough to see little way out to sea. This path was busier with dog walkers and tourists. Dancing Ledge was busy with divers, swimmers and groups of kids. The rain set in earlier than forecast but it didn’t bother us anymore! our friends met us just after the Anvil point lighthouse and I was so pleased to hand my heavy ruck sack over and walk the last leg to Durlston without the extra load. At last at Durlston Head! We joined other soggy visitors at the lovely coffee shop at the Country Park where I enjoyed another of my Milk free Mochas and a delicious gluten free cake! The next morning the sky had cleared and the sunshine welcomed us to Swanage! 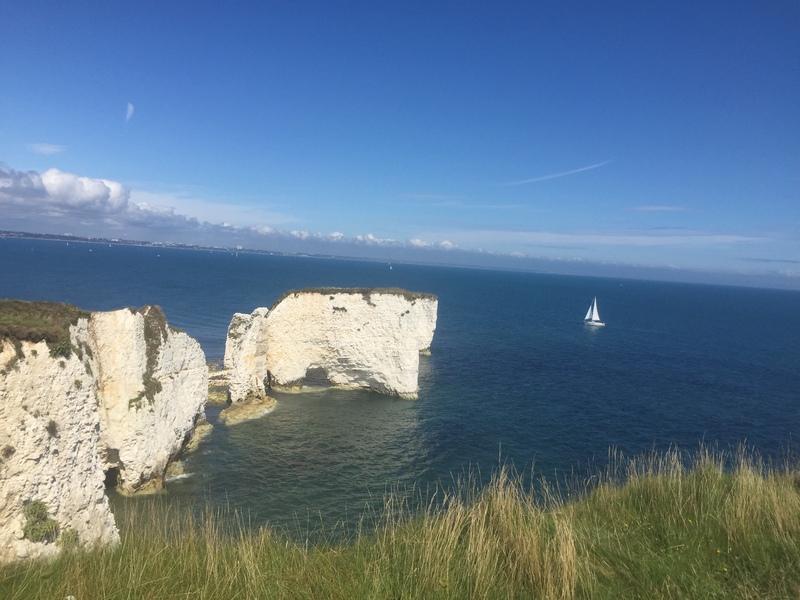 We packed up a tasty picnic using the wonderful Deli in the town and altogether we ventured along the beach and up more cliffs to Studland! It was such a beautiful day and with no time constraints we could stop and start as we pleased. We sat on Ballard Down and ate our lunch then joined the crowds at Old Harry Rocks and watched the Bournemouth Air Day. As we arrived at Studland the Red Arrows were performing. We found a pub so Mr C finally had his cider then we caught the bus back into Swanage. Our final day it was warm and sunny enough to all go down to the beach. We hired deckchairs, swam in the sea and loved the people watching as we relaxed. A proper English Summer’s day, kids and Dad’s building sand castles, mum’s unwrapping sandwiches wrapped in foil. Grandparents taking the strain of enthusiastic toddlers. Bliss. At 3pm we caught the ‘X43’ bus back to Weymouth… that was an adventure in itself, but I’ll save it for another time! Well walked, Paula! Exmouth to Weymouth next year?